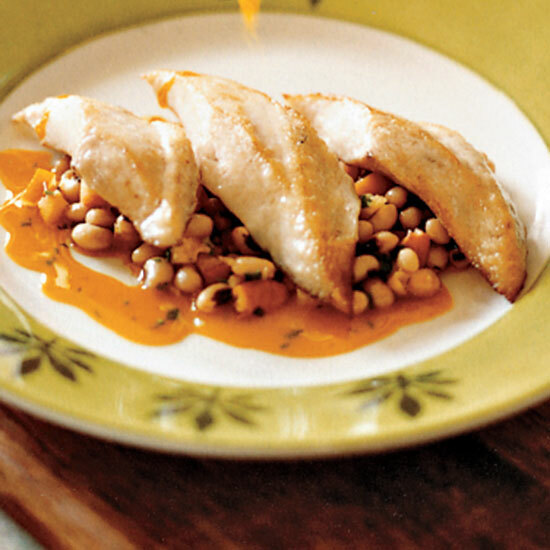 Recipes from award-winning chefs, including Daniel Boulud's exquisite skate with mushrooms and hazelnuts. 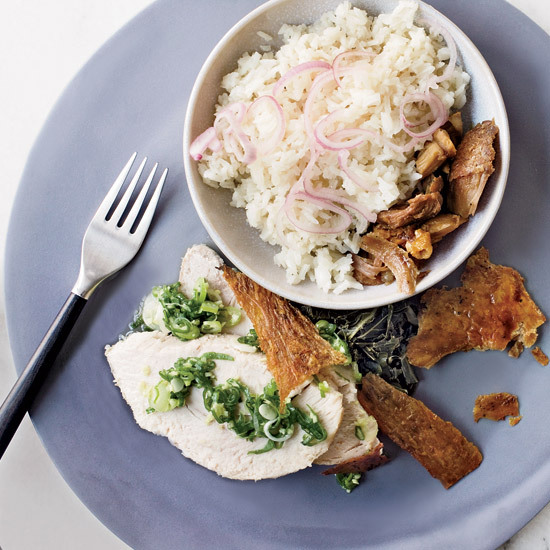 David Chang recommends poaching turkey breast in leftover turkey stock before serving it with ginger-scallion sauce, based on his favorite condiment at Great N.Y. Noodletown in Chinatown. Eric Ripert’s vivid black-eyed pea salad was inspired by acarajé, a traditional Bahian dish made by pounding raw peas into a paste and mixing them with dried shrimp. Ripert cooks whole peas and tosses them with a lime vinaigrette and chopped dried shrimp. 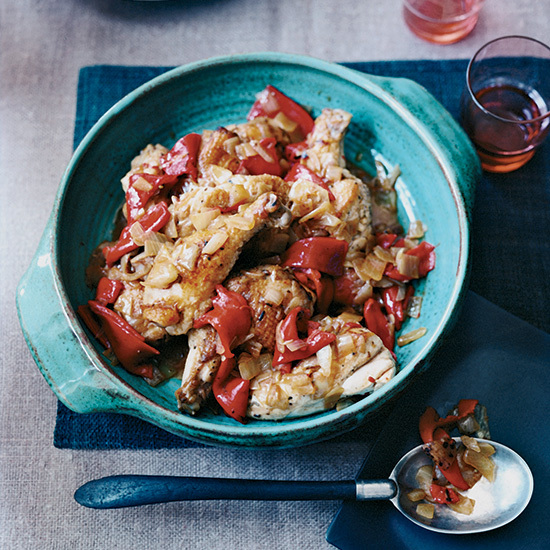 The spicy dressing also moistens and flavors the pan-seared mackerel. 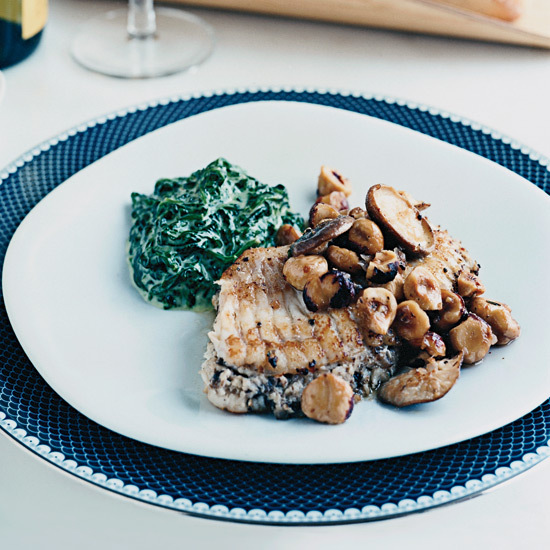 This luscious dish by Daniel Boulud is deceptively simple: skate stuffed with duxelles, a mixture of mushrooms and shallots, served alongside creamed spinach. An intensely fruity wine like an Amarone boils down to something so rich, it’s almost meaty. 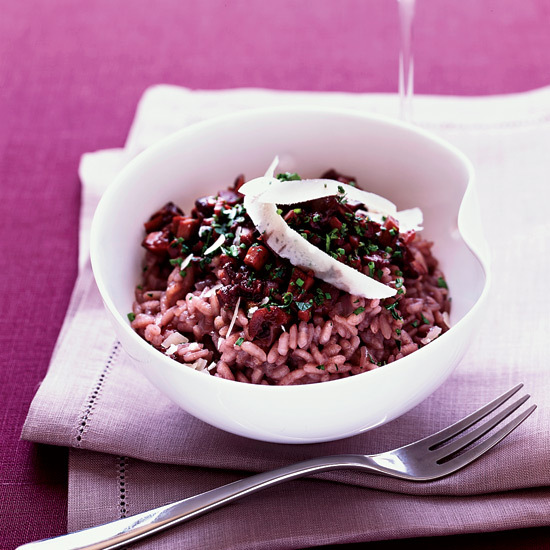 Jean-Georges Vongerichten reduces the Italian red with thin slices of earthy mushrooms, then swirls the purply sauce into a risotto; it would be equally delicious on polenta or even on a piece of grilled bread. For Michael Psilakis, macaronia (“pasta”) has always meant chicken stewed with spaghetti, tomatoes, cinnamon, raisins and pine nuts. Those are the dominant ingredients here, except he’s substituted chicken with cauliflower. Terrance Brennan cooks this pasta risotto-style by stirring in rich chicken stock a ladleful at a time. 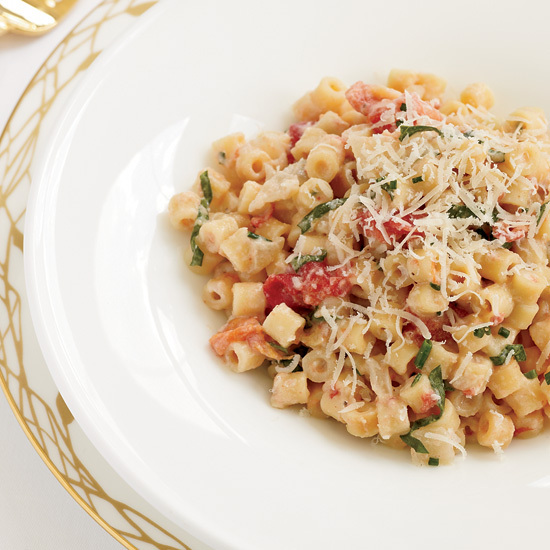 As the pasta releases its starch, the dish becomes delicately milky. Instead of finishing the dish with a knob of butter, he folds in fresh goat cheese, which turns creamy in the gentle heat. 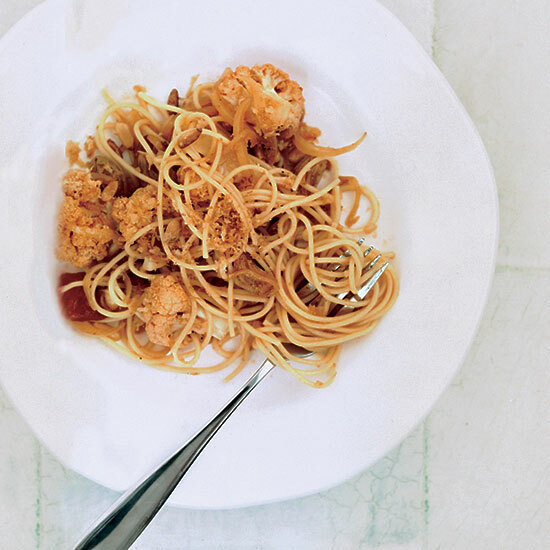 Brennan uses a small, tube-shaped pasta called ditalini, but any small cut works. 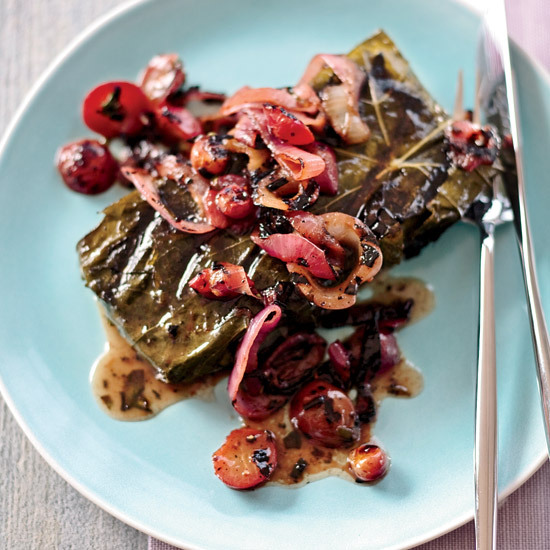 To keep fillets intact, chef Anita Lo of Annisa in New York City wraps them in briny grape leaves—a tasty combination. 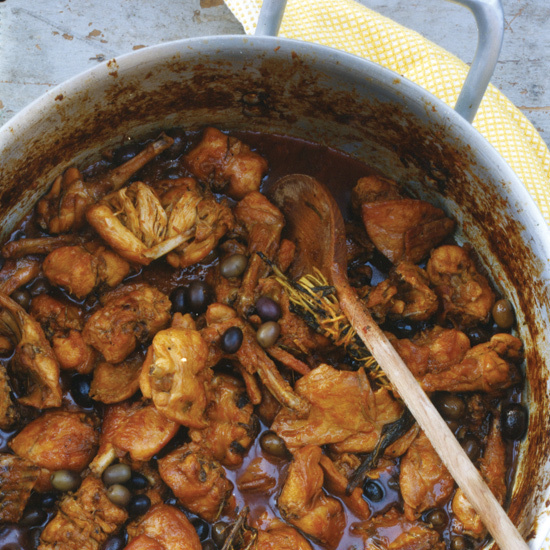 “This is one of my favorite things on the planet,” says Marco Canora about his savory rabbit stew. He loves sharing the recipe with his students because it’s an opportunity to teach them about making battuto (similar to soffrito), a mixture of sautéed onion, celery and carrots that’s the base for many Italian dishes. The quality of the seafood is key in this lemony, piquant dish. 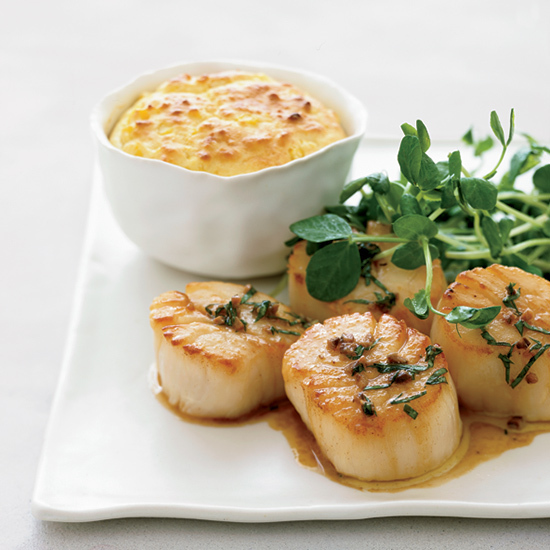 April Bloomfield recommends seeking out day-boat scallops, caught by fishermen who return from a day at sea with supremely fresh scallops that haven’t been treated with any kind of preservative. Instead of being milky white, they’re almost coral-colored. Pilar Sanchez, an elderly home cook who lives in Asturias, taught Mario Batali and Mark Bittman how to make pollo casero, a luscious chicken in rich white wine and pepper sauce. When they asked where she buys her poultry, Sanchez told them to go to her yard and listen for the “singing in the field” from the chickens she raises.